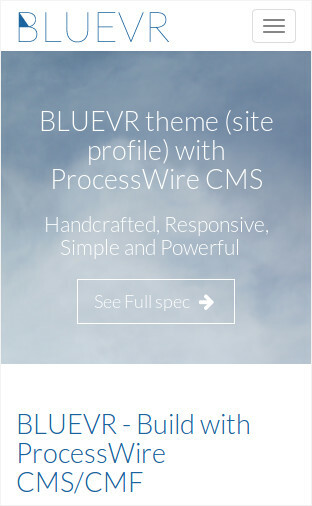 Blue-VR is a ProcessWire site profile for corporate or personal website. We named this profile as Blue-VR. This site profile was made by Gayan Virajith. 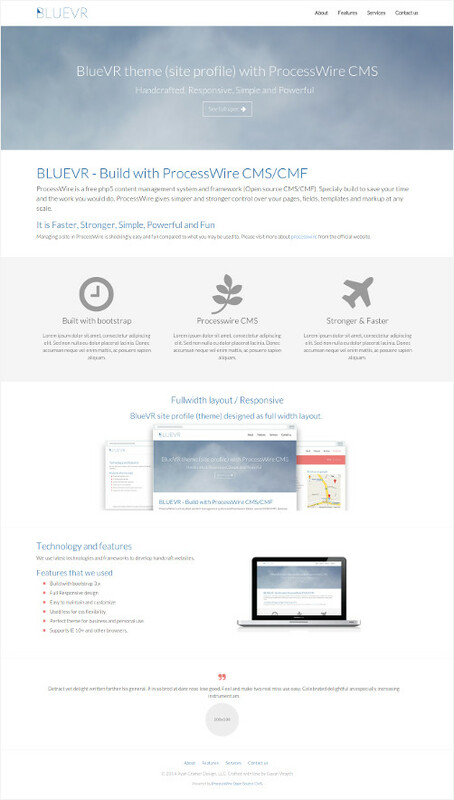 Profile can be usedwith ProcessWire open source CMS/CMF version 2.5+. The front-end uses the Bootstrap 3.x css framework for to get the responsiveness and mobile friendliness. Please take a copy of the latest ProcessWire. Download or clone this repositpory into your document root (project root). Follow the install guide and select site-blue-vr as your site profile during the installation. Please submit as an issue, I am happyto response back. BugFix #1 - undefined $siteSetting variable notice. Thanks to Processwire Forum member Mont. I would like to thanks Ryan Cramer (Founder, Lead developer of the ProcessWire open source project) for giving us great CMS/CMF and modules. David Karich for providing such a nice module AIOM+. Maheshika Lakmali (My loving wife) who has done all the graphic designs. Great site profile with lots of tools under the hood. When I try to install the profile, PW doesn't show the option to install blue-vr-site profile. IF I erase all the profiles in PW, except the blue-vr-site, PW doesn't any option. Thanks. Did you rename the site profile to `site-blue-vr`? Thanks, Gayan, for answering. I fixed it. It was a permission issue. I gave the folder wrx rights and it worked. Glad you fixed it. Thank you so much for using this site profile. That's a very nice site profile you got there! Thanks for sharing it. I'm already having some fun forking it. Would it be great to see it running without having to install it first. Thank you so much for using this site profile. I have requested a free hosting on lightning.pw. I hope they approve my request. Thanks again for your folk :). Happy ProcessWiring ! Can you share a DEMO of your profile? Hi, that's a great starter profile! Really thought out well. I have problems sending contact form emails with PW 2.6.1. It worked before so I wonder if the version of PW has anything to do with it.